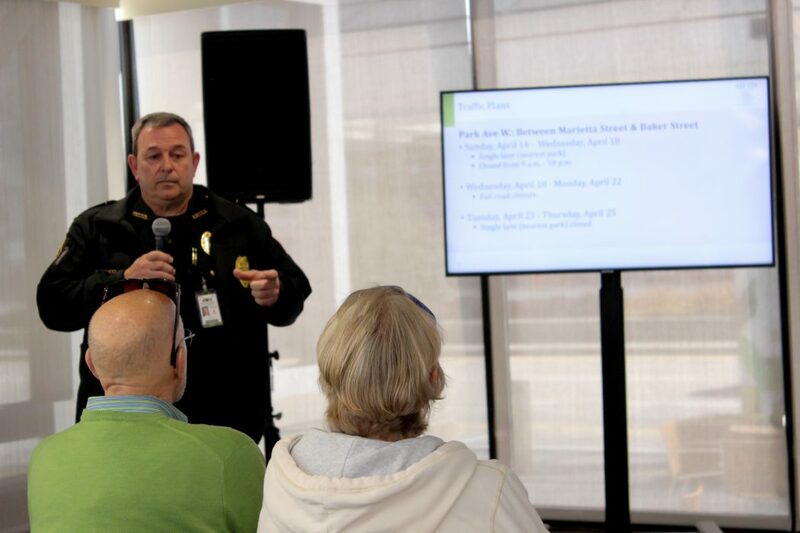 Officials from the Georgia World Congress Center Authority (GWCCA) and Happy Endings Productions met with Centennial Olympic Park community members on Wednesday (April 3) to discuss details of the upcoming SweetWater 420 Fest taking place April 19–21 at the Park. Got a Minute to Give? Community members and neighbors of Centennial Olympic Park can expect to hear amplified sound beginning on Wednesday, April 17t and will begin to see road closures on Sunday, April 14. Paul Guerrucci, GWCCA’s Director of Public Safety sharing traffic information. 15-minute audio checks, 5:30 p.m.-8 p.m.
PA Tuning, 5 p.m.-8 p.m.
420 Fest 5K, 8:30 a.m.
from 9 a.m. – 10 p.m.
Full road closure, both directions. COP Drive: Between Baker Street & Andrew Young International Blvd. For more on upcoming events, news, and announcements surrounding the Park, follow us on social media at Centennial Olympic Park (Facebook), and @Centennial_Park on (Twitter and Instagram). With a background in collegiate sports marketing, Parker Hendricks joined the Authority in 2016. He is the GWCCA’s social media guru. Winston Churchill described customer service the best, "We make a living by what we get. We make a life by what we give."